The online version of this article ( https://doi.org/10.1186/s12864-019-5658-5) contains supplementary material, which is available to authorized users. 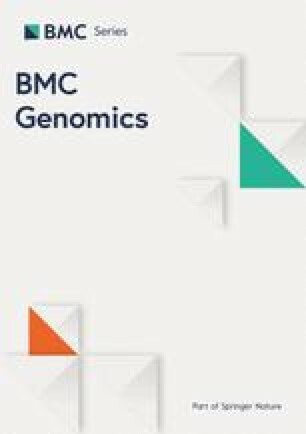 Proteomics has been developed as an important approach for studying plant functional genomics , which bridges the gap from transcriptome to metabolome  and can be used to detect the post-transcriptional modification [3, 4]. Numerous techniques, such as two-dimensional electrophoresis (2-DE), differential in-gel electrophoresis (DIGE), matrix-assisted laser desorption/ionization time-of-flight/time-of-flight mass spectrometry (MALDI-TOF/TOF MS), label-free quantification and isobaric tags for relative and absolute quantitation (iTRAQ) have been used extensively to study the global protein accumulation level in plant tissues [2, 5, 6, 7, 8, 9]. Compared with gel-based techniques, gel-free techniques (label-free and iTRAQ) are characterized by their high sensitivity and ability to identify highly acidic/alkaline or hydrophobic proteins . Still, gel-based proteomics techniques are valuable for the visualized protein gels, protein spots abundance and information of protein isoforms coding by the same transcript, which could not be achieved by gel-free techniques [11, 12]. The function enrichment of method-specifically extracted proteins after LC-MS/MS from three protein extraction methods was performed by GO analysis. We found that these proteins were enriched according to their different functions (Fig. 4, Additional files 6 and 7). The six GO terms could be identified for specific proteins in the BPP- and TCA-B-extracted proteins (cytosol, endosome, plastid, cytoskeleton, peroxisome and endoplasmic reticulum). The TCA-extracted proteins specifically identified by LC-MS/MS were poorly enriched in these GO terms. However, it does not necessarily mean that TCA cannot extract proteins with these functions because these functional proteins may be present in the proteins co-extracted by the two or three methods. At present, many protein extraction method studies are only focus on one proteomic technique, the 2-DE or high-throughput proteomic techniques [31, 32, 33]. The use of proteins extracted by the same method for both 2-DE and LC-MS/MS studies can avoid false differential abundant proteins associated with different extraction methods, allowing identification of a higher number of proteins with various isoforms [10, 34]. 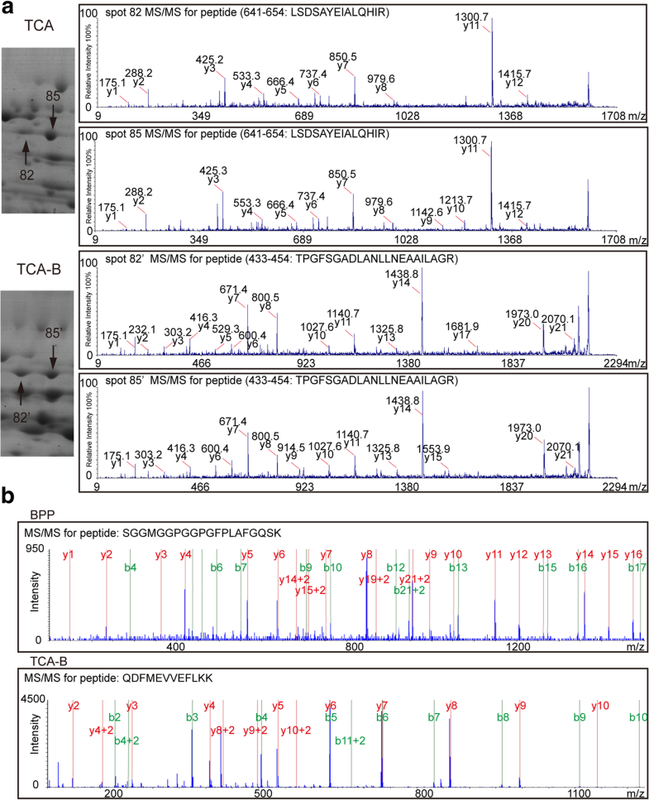 Additionally, the differentially expressed proteins identified from the LC-MS/MS and 2-DE techniques could be different [35, 36]. 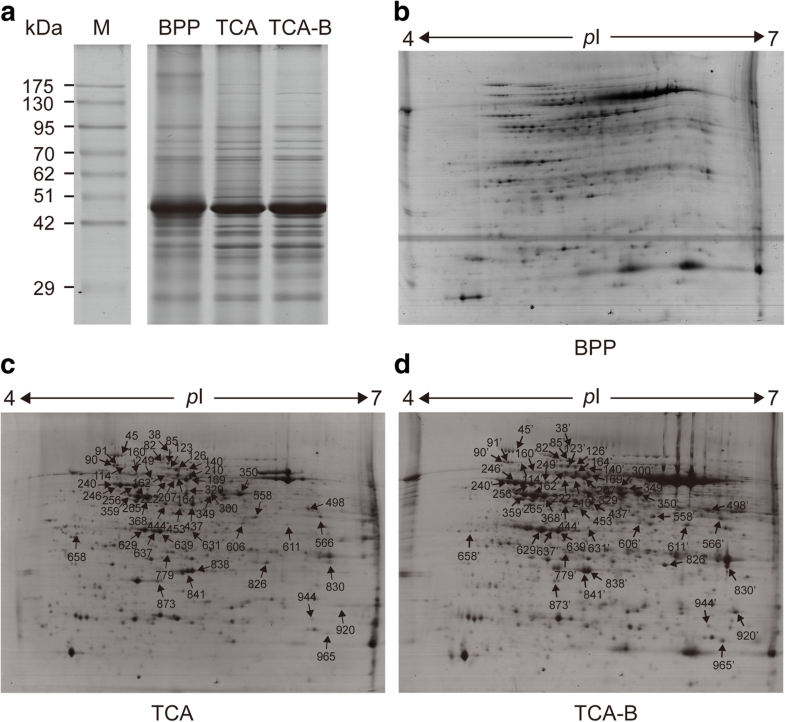 Herein, we found that for the ATP-dependent zinc metalloprotease FTSH 8, both TCA-B and TCA could reflect the visualized information for protein isoforms in the 2-DE gels. 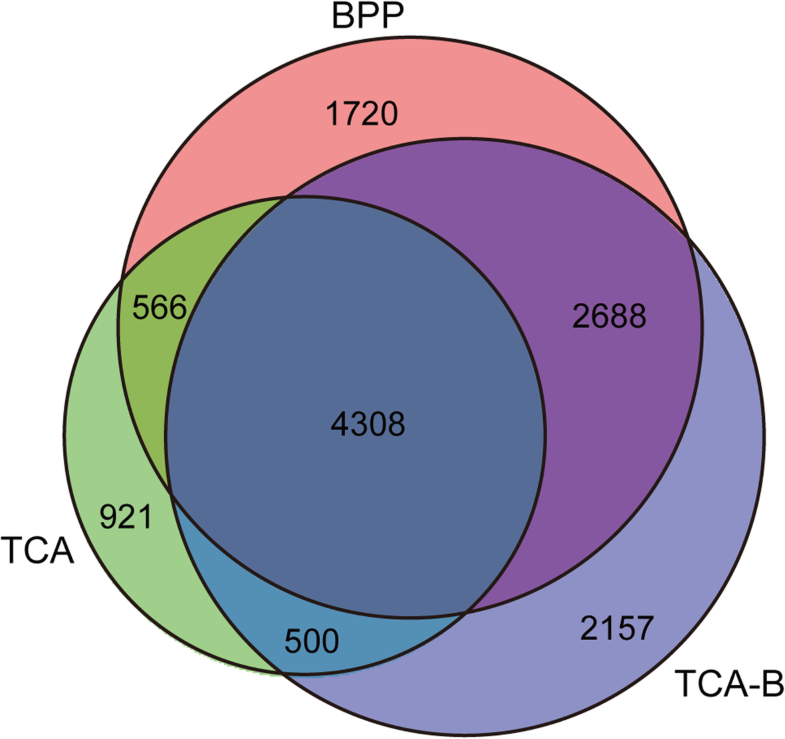 By contrast, FTSH 8 could be only identified by BPP and TCA-B in the LC-MS/MS study (Fig. 5). 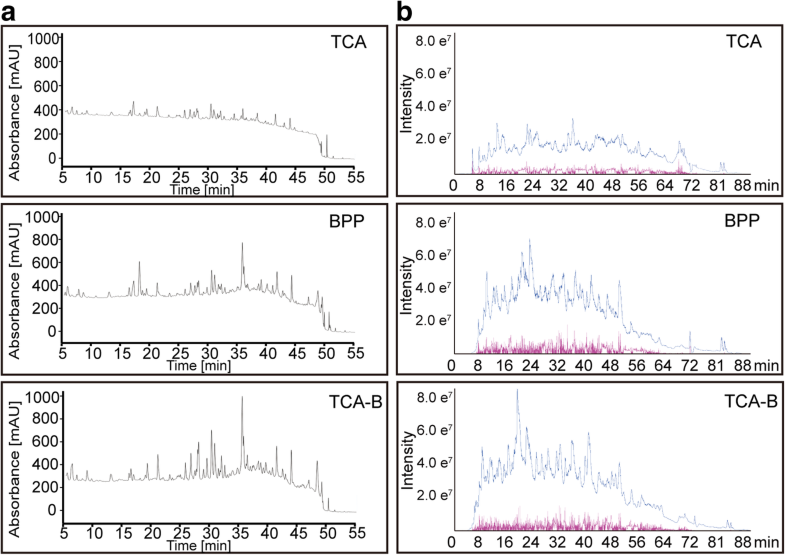 This finding demonstrates that applying TCA-B simultaneously for both 2-DE and LC-MS/MS studies allows the identification of more proteins over a broader range and with high sensitivity. Additionally, TCA-B supports the identification of proteins in different variable cleavage forms by 2-DE, and thus it can be better used to analyse the proteome studies of different physiological processes in polysaccharide and polyphenol-rich plants.